The Project SensorWeb team is on a mission help people leverage the Web to bring open transparency to the physical world around us. Open data, Open platform, Open web, Crowdsourcing… these are the attributes we have in mind when we innovate and design prototypes. We believe that with the right (and open) data, we can make better decisions and improve our quality of life and the experiences of everyone in our local communities. As you may have seen, we chose to monitor air quality in our pilot project, measuring particulate matter of 2.5 micrometers or less (PM2.5), since it is a major component and standard for an index of urban air pollution. The most recent WHO study shows that excessive exposure to PM2.5 can cause cancer, lung damage, heart attacks, arteriosclerosis, premature births, and respiratory diseases in children. Since PM2.5 presents a growing health risk to people around the world, it seemed like the right place for us to start. We believe that easily accessible, hyper-local data for PM2.5 from an open platform will be beneficial to people who suffer from air pollution, especially the elderly, young, and those with pre-existing health issues. 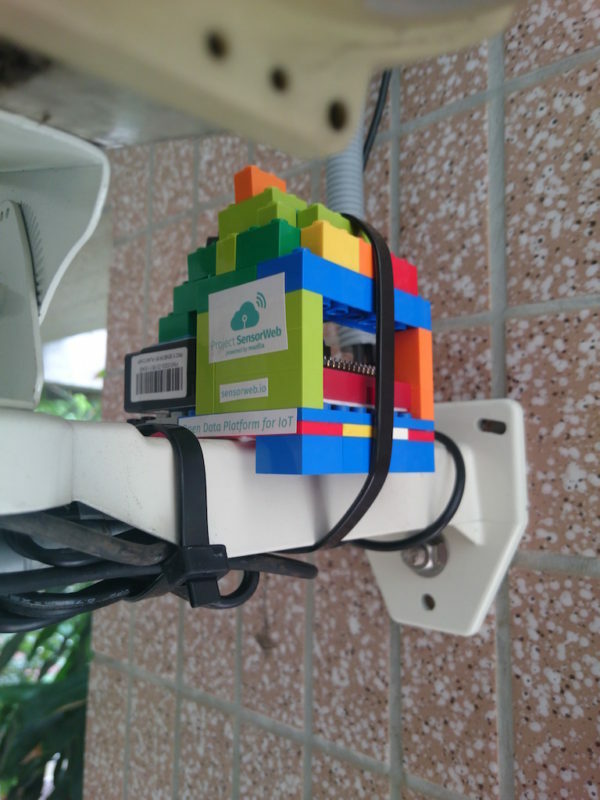 So, we charged ahead and successfully deployed an array of PM2.5 sensors in Taipei, along with a few other sensors in San Francisco and London, and have a backlog of requests from communities around the world. After assembling this minimum viable prototype, which includes hardware as well as a web service, the Project SensorWeb team is ready to validate our hypotheses around user interests for subscribing, sharing, and contributing to an open data service. In our preliminary experiment, we initiated a three-week poster campaign in Taipei City during the July to August timeframe. We selected three areas where air pollution is notoriously serious and got permission from local residents to place posters around their community. 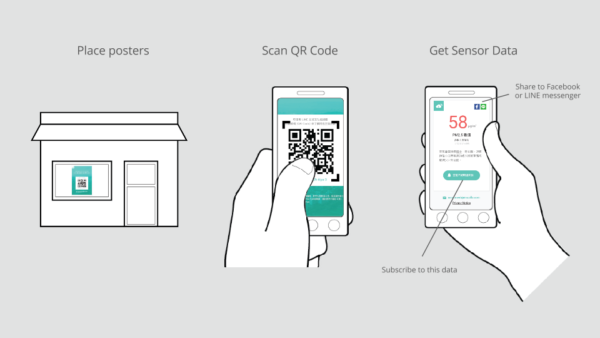 Passers by would then be able to scan the QR code shown on the poster to get access to the PM2.5 measurement via a mobile-optimized Project SensorWeb page with the actual real-time, hyper-local data. The image above shows the user flow from poster to mobile website. Early data shows us that from the first three weeks of this poster experiment, we potentially exposed our message to around 1,000 people; we were happy to see a visitor-to-subscriber conversion rate of 18.68%. Although only a small sample, these results have given us confidence to expand the scope of this experiment, and to keep believing that consumers will subscribe to and promote a service that provides them access to hyper-local environmental data. You can expect more to come in the upcoming weeks, but you can check out our wiki page if you want to learn more in the meantime. This is a fantastic project overall! As a designer, i would have loved to seen the poster you guys put up. Thank you mozilla! Seriously great project, open web, open Data. Awesome job guys! I sincerely hope that the accession of The Trump as Emperor of the known world won’t block the inclusion of Beijing and other notoriously polluted cities on the Chinese mainland. Well done, folks!